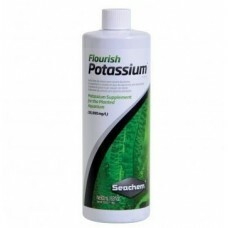 Flourish Potassium™ contains 50,000 mg/L of potassium suitable for the natural planted aquarium. Potassium is one of several elements that are vitally important to maintaining a vigorous level of growth in a planted aquarium. Potassium can become depleted in a rapidly growing system or when the source water has a low mineral content. In these cases potassium could become the limiting factor to growth. Use Flourish Potassium™ to prevent potassium depletion (signs of which include yellowing in older leaves) and maintain the highest level of growth. The most easily obtained sources of potassium are potassium nitrate and potassium phosphate. Both of these sources add to nitrogen or phosphorus as well as potassium, making it virtually impossible to target a specific NPK ratio. Flourish Potassium™ is derived from potassium sulfate, allowing the user to adjust potassium levels without affecting nitrogen or phosphorus. Use 1 capful (5 mL) for every 125 L (30 gallons*). This dose raises potassium by 2 mg/L. Repeat 2–3 times per week or as needed (in response to signs of potassium deficiency in older leaves which includes: chlorosis (yellowing), necrosis (death/browning), and weak stems and roots.